Depart from selected hotels or a central location in Osaka and climb aboard a comfortable vehicle for the transfer to Shin-Osaka station, where your futuristic bullet train awaits. Climb onboard and marvel at the vehicle’s incredible velocity during a 2-hour ride to Hiroshima. On arrival, continue the journey to Miyajimaguchi by coach or train then board a boat travelling to the majestic Sacred Island, a landmass hailed as one of Japan’s most beautiful landscapes. Disembark and discover the natural and cultural treasures of the UNESCO World Heritage-listed island for 45-minutes with your guide. See the shimmering Itsukushima Shrine then revitalize with a delicious lunch in a local eatery (own expense). Reboard the boat and cruise back to Hiroshima to reflect on the heartbreaking history of the region. Take a moment of contemplation at the Hiroshima Peace Memorial Park, a historical site near to where the atomic bomb exploded. See exhibitions that articulate the carnal destruction the bomb caused and marvel at the city’s regenerative recovery. Finally, board a bus to the Atomic Bomb Dome (Genbaku Dome), a skeletal structure that miraculously survived the 1945 attack. Return to the station for the exhilarating return journey on the bullet train, where the tour concludes. The Miyajima trip was a lot of fun, seeing the floating temple and walking through the streets eating and shopping. Hiroshima is a very thought provoking location. The tour guides and bus drivers are first rate. Enough time is given at each location. Transportation is comofortable. The trip turned out to be rather stressful because of bad coordination between Viator and their Japanese counterpart. We booked this tour and chose to be picked up at the Swissotel in Osaka. We then also booked our hotel stays here in the same hotel. But that morning came and it was almost 7:45, but still there was just us waiting for our tour mates. The hotel concierge was thankfuly helpful and called the tour operator on our behalf. Thats when we knew they were all in the Granvia Hotel. Problem was, nobody told us so. We were at the Swissotel waiting waiting waiting! Thanks to the Swissotel, we almost didnt make it for thr tour. We got there just fine but was so stressed and was ranting and the tour guide told us “...it is always Viator!” with a sigh. Meaning, if you book via Viator and chose to be picked up at the Swissotel, they couldn’t coordinate it well with their Japanese operator. 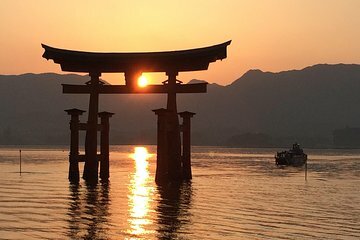 Hiroshima and Miyajima are both great places. They got good Japanese tour guide, very knowledgeable and entertaining. Very good and interesting tour. The tour operator took really good care of us, getting us to the train in Osaka, then our guide in Hiroshima Sami met us and stayed with us until putting us back on the train to Osaka. We were met there again and they helped us get back to the original meeting point. 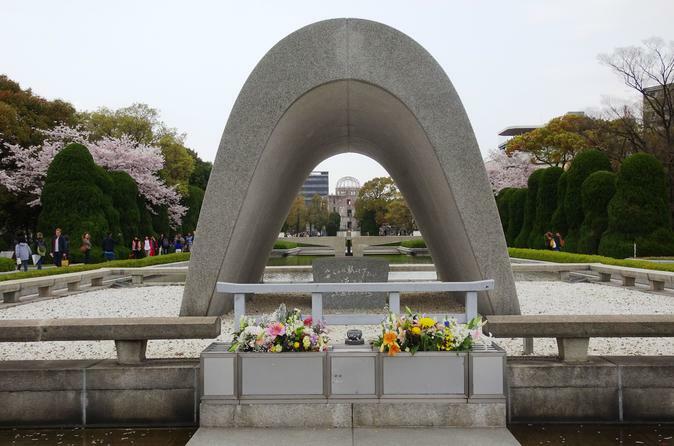 Hiroshima was an emotional experience, and they present everything as a monument to peace. It's worth the visit. Perfectly done!!. A lot of stories about Hiroshima and its history. Visiting Miyajima was exciting, however very crowded. Strongly recommend!! really good day in Miyajima and Hiroshima. All the Japanese guides spoke clear english. One guide will meet you at Osaka station and walk you to the shinkansen platform where you'll jump on the train and head for Hiroshima station, where another guide will meet you and take you to the bus. The only thing i didn't like was the amount of time left to see the Hiroshima Peace Memorial Museum. By the time we got there, it was around 4pm and closes at 5, which is no where enough time to explore this moving place. This tour was excellent and worth it! The vendor is JTB Sunrise and they do it first class. We were met at Hotel Granvia and taken by taxi to Shin Osaka station where the guide escorted us to the platform and made sure we were off to Hiroshima unescorted, once upon arrival another guide met us as we came off the platform, than taken to the bus. On the return was handled the same way. Our guide spoke excellent English and did a excellent job in providing great information on each area we went too. Its a long tour but worth it if you have a limited time in Japan. This tour is a MUST. First, we met a greeter at the Swissotel Nankai Osaka Hotel Bell Desk which was about a 10 minutes walk from Osaka Monterey Grasmere appreciated that they name a specific area to meet BELL DESK. We were transferred via taxi to the Shin Osaka station to catch the Japan Rail to Hiroshima--smooth 200 mph ride. From there, we hopped onto a comfortable tour bus which took us to pass Hiroshima to Miyajima and Hiroshima. We had the privilege of having Mitsu of Sunrise Tours as our Tour Guide--what a humble, sweet, and soft spoken lady. She was audible and spoke English perfectly. A native to Hiroshima, we enjoyed her sharing personal experiences about the area along with the necessary tour guide script. We love her passion for Miyajima/Hiroshima. We jumped on a ferry to Miyajima Island. We pet deer hang onto your things--they eat paper LOL, took alot of pictures, and witnessed a wedding procession before being released for free time. Our group stopped to take a lot ... A LOT ... of pictures/toire breaks at the start of the walking tour which slowed down the tour however, Mitsu was gentle but firm to move us along. Note: The longer you stop to take pictures in the beginning, the shorter your free time to shop and eat. Tip: Don't rush allow your guide to move you along and take pictures later or be quicker about taking pictures. We had honor of having Mitsu join us for lunch she recommended okonomiyaki at one of the restaurants. We boarded the ferry back to our bus which took us to Hiroshima. The tour restarted at the Bomb Dome and Mitsu narrated all the way to the Museum. Not going to spoil the experience. You just have to DO IT!!! In the end, we boarded the bus to Hiroshima Station and rode the Bullet Train back to Shin Osaka Station. Surprisingly, our taxi took us to our hotel instead of taking us back to Swissotel. DOMO ARIGATOU GOZAIMASU! !